We’d love your help. Let us know what’s wrong with this preview of Bitter Orange by Marshall Moore. To ask other readers questions about Bitter Orange, please sign up. I wrote it, so what can I say, other than how amazing it is? Bitter Orange attempts to explore this rather fascinating situation through the eyes of our hero, Seth Harrington. Harrington discovers, quite by chance, that he has the ability to remain undetected when shoplifting, an event that may have gone unnoticed if not underlined by additional incidents in the local movie theatre. As the story progresses, the protagonist progresses from accident, to experiment, to intent. As his actions become more brazen, he confronts some more unsavory aspects of his personality hiding under the surface. The plot itself transforms in a less cohesive way, for me, than the personality of the main character. At first, the story looked like it was going to use invisibility as a literal device. However, as the book progressed, the author seemed so invested in the main character's past, personality and internal dialogue that I started to think the story was more of a metaphor. Just as I had become comfortable with this direction, however, the plot quite suddenly became very literal - only in very last part of the narrative. Not only was this transition bumpy, but the story ended abruptly in a question mark - leaving me feeling like I had read a unnecessarily long short story written for effect, rather than a complete novel. To me, Bitter Orange is a book with two stories merged together - not quite successfully. Firstly, there is a short story about someone who develops an "ability" that leads him to a particular and interesting outcome that would leave the reader with a satisfied raised eyebrow. This is a short story I would have enjoyed. Secondly, there was a more involved narrative about a burnt-out corporate high-flier who retreated from life after his partner died in New York's September 11 attacks. An appearance of invisibility is manifested by his dwindling investment in life and, as a reader, we follow his journey on the outskirts, wondering if he can find his way back to significance and complete visibility. Could it be found through the resolution of his feelings towards his roommate? The prose itself is satisfying - I certainly couldn't raise any complaints. The author can clearly write, and write well. There is a tendency to be completely unvarnished in his handling of thoughts and behaviours. If the expectation is that the characters are going to quietly contemplate existence in a rather sterilised way fit for general consumption, the reader will possibly be shocked and even offended. I don't really have a problem with the grittier viewpoints, but I thought perhaps that some of the more sexual content encountered didn't really enhance the story significantly. Marshall Moore follows his collection of enigmatic and delightfully twisted short stories, "Infernal Republic," with an equally inventive novel about a character we can’t always see. Notice how protagonist Seth Harrington is already fading away on the book’s cover. If "Bitter Orange" were a feature film showing at your local theater, a sign on the door would say: ABSOLUTELY NO ONE ADMITTED DURING THE LAST 15 MINUTES. The why of things doesn’t appear until the final pages and it’s well worth the w Marshall Moore follows his collection of enigmatic and delightfully twisted short stories, "Infernal Republic," with an equally inventive novel about a character we can’t always see. Notice how protagonist Seth Harrington is already fading away on the book’s cover. If "Bitter Orange" were a feature film showing at your local theater, a sign on the door would say: ABSOLUTELY NO ONE ADMITTED DURING THE LAST 15 MINUTES. The why of things doesn’t appear until the final pages and it’s well worth the wait. The problem Seth Harrington thinks he has isn’t the worst problem he has. Personally impacted by 9/11, Harrington has allowed his days and nights to take on an out-of-focus aimless quality as though he isn’t engaged in his life. In spite of a fling with Elizabeth in Spain, he can’t connect with people, either because he isn’t sure of what, if anything, he wants or because others aren’t seeing him as he is. Others not seeing him is the problem he thinks he has. By fits and starts, he is becoming invisible—literally. But unlike the daring-do characters out of comic books and high fantasy, Harrington not only can’t control his growing ability, he doesn’t seem inclined to use it to save the world or fight crime. In fact, he first uses it to steal a bottle of wine from a convenience store. Back in San Francisco, Elizabeth—who becomes Seth’s tattoo artist of choice because she’s very good—wants to remain as important to him as she ever-so-briefly was in Spain. While Seth is, or potentially is, more attracted to his roommate Sang-hee (even Elizabeth begrudgingly sees it), he cannot seem to embrace the life he prefers. He speculates about just what that says about him. As the invisibility problem becomes more complex, Seth travels to Portland and Las Vegas to try and find himself. He notes that the people in those towns can’t see him either. He feels bad taking advantage of that fact. Marshall Moore tells an inventive story, one with prose as likeable as his protagonist, though some readers may want a more highly focused plot. Moore keeps both the reader and his protagonist guessing about just how and why a man becomes invisible and whether the problem Harrington thinks he has is literal or figurative. The solution to the problem provides a fitting climax to a well written, fanciful tale. Poor Seth: he didn’t see it coming. Dark and fascinating, really enjoyed this! Seth Harrington is an ordinary young man with an extraordinary ability: he can become completely undetectable. Unseen, unheard, unknown. And he can make others see things in ways contrary to reality. But he doesn't use this power as a superhero would. Rather, he uses it to commit petty crimes, like use a movie ticket stub as money or steal a bottle of cheap alcohol. Bitter Orange is not the tale of a normal man who becomes a hero, or even a special man with special powers. Rather, his life is as Seth Harrington is an ordinary young man with an extraordinary ability: he can become completely undetectable. Unseen, unheard, unknown. And he can make others see things in ways contrary to reality. But he doesn't use this power as a superhero would. Rather, he uses it to commit petty crimes, like use a movie ticket stub as money or steal a bottle of cheap alcohol. Bitter Orange is not the tale of a normal man who becomes a hero, or even a special man with special powers. Rather, his life is as mundane as it gets, and so are the lives of everyone he knows. His paranormal ability is the one remarkable thing about him, and this drives much of his character throughout the novel. Like many people who have yet to settle into the routine of normal adulthood, Seth doesn't really know who he is or what he's supposed to be doing with his life, and this is reflected in how he uses his powers. He turns invisible to creep on the homes of "normal" people and uses a one dollar bill to pay for a cell phone. Drifting through life, his morals and values are as gray as fog. Moore writes with a sharp, snappy voice, giving his characters lively yet cynical voices that spring from the page. I think many people will relate to Seth's point of view as he both mocks the lives of others and seeks purpose in his own. He's not an admirable character, but rather one who is remarkable in his unremarkable-ness. This lends Bitter Orange a touch of realism even though the premise takes it into the realm of fantasy. What makes this novel especially interesting, to me, is its portrayal of the everyday and its lack of moralizing or melodramatics. Too often, characters in "superhero" type situations fall into the rut of being perfect, if tormented, people who always, always do the right thing. It gets mundane, and Bitter Orange offers an intriguing alternative to the Hollywood trope that has seeped into literature. The story is somewhat slow-paced at the beginning, but toward the latter part of the novel, twists abound and expectations are turned on their heads. Overall, Bitter Orange is an entertaining and enjoyable read. After having his life turned upside down by 9/11, Seth leaves his lavish lifestyle behind to move all of the way across the country to start his life all over again. He has a roommate named Sang-Hee who is the only person who knows about his secret. Seth can become invisible, and if he is not invisible, he can deceive people into believing whatever he says. He is able to pay for an iPod with only a few dollars, and he is able to steal chips from a casino in Vegas. Seth can do basically anything After having his life turned upside down by 9/11, Seth leaves his lavish lifestyle behind to move all of the way across the country to start his life all over again. He has a roommate named Sang-Hee who is the only person who knows about his secret. Seth can become invisible, and if he is not invisible, he can deceive people into believing whatever he says. He is able to pay for an iPod with only a few dollars, and he is able to steal chips from a casino in Vegas. Seth can do basically anything he wants, but is that enough for him? Bitter Orange by Marshall Moore is the last book I read in 2013, and in this regard I saved one of the best for last. It is an extremely well written, imaginative, provocative and by degrees disturbing multi-themed story that is part urban fantasy and part mystery, but is firmly rooted in contemporary reality. Through the main character of Seth Harrington, who possesses the ability to become invisible, Mr. Moore turns the more accepted notion of superhero in speculative fiction on its ear to explore the darker motivations and actions of an ordinary person who possesses extraordinary powers. The author grounds the fantastical elements of this story and Seth’s increasing confusion and anxiety about his ability to become invisible against the backdrop of the disquiet and weariness of American (urban) life in a post 9/11 and dotcom crash world. Particular to the main protagonist’s personal story is the question of whether Seth can move beyond the loss, pain and trauma of those falling towers to once again find his place in the world. Mr. Moore writes in a literary style with a refined sophistication and a sardonic humour that I found beyond appealing. Seth’s tale unfolds slowly, leading the reader down an unassuming path given what we learn about the character over the course of his story until the last portion of the novel when the author reveals the reasons behind Seth’s invisibility in a completely unexpected twist, and a climatic ending that leaves the reader guessing. 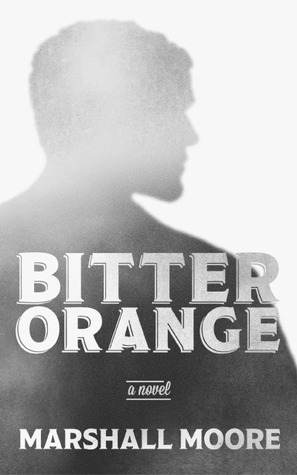 The complete review of Bitter Orange by Marshall Moore is available at Indie Reviews. I was interested by the take on 'super powers' presented by this book. Our main character Seth is not your typical superhero, well he's not a superhero at all, his power of invisibility only work in morally grey situations such as to stop an attack by harming the attacker. Events are further complicated by the influence of Seth's room-mate Sang-hee who encourages Seth to explore his new found powers and the slightly unbalanced tattoo artist (and former one night stand) Elizabeth who seems desper I was interested by the take on 'super powers' presented by this book. Our main character Seth is not your typical superhero, well he's not a superhero at all, his power of invisibility only work in morally grey situations such as to stop an attack by harming the attacker. Events are further complicated by the influence of Seth's room-mate Sang-hee who encourages Seth to explore his new found powers and the slightly unbalanced tattoo artist (and former one night stand) Elizabeth who seems desperate to remain in Seth's life. One of the great things about this book is that Moore keeps the reader guessing until the end of the book and the reader learns as Seth learns, we aren't told anything through narrative before the character knows so each twist Seth experiences the reader experiences too. At times it's almost possible to forget that this is a science fiction novel and not a commentary on modern life as the reader learns more about Seth and his past and through the reactions to Seth's attempts at redemption after using his power. I liked the concept but thought some parts were underdeveloped. The last part from the reveal onwards was rushed and disjointed. I'd like to see this expanded and fleshed out.